News Flash! Revolve is proud to announce that it is donating more than $3,000 to local trails! 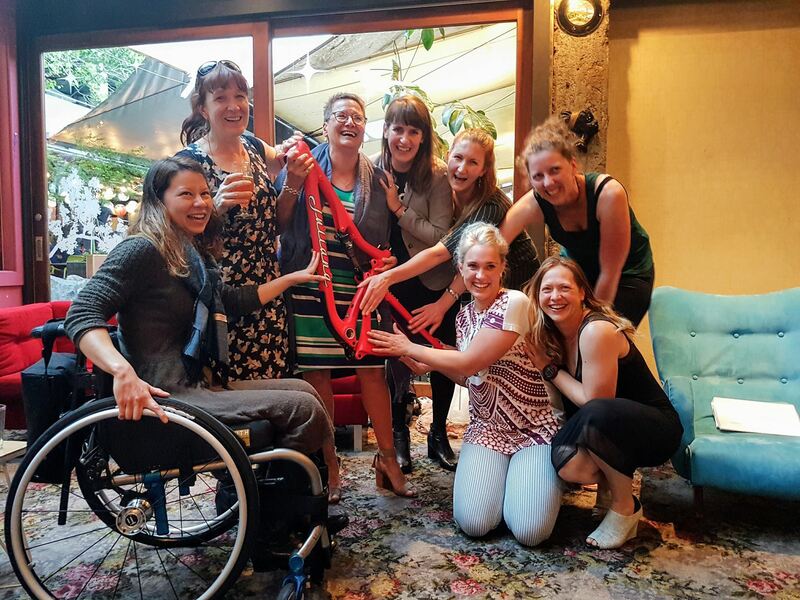 Since it was founded in 2009, Revolve Wellington has been facilitating opportunities for women in Wellington to enjoy cycling – both on and off the road – by hosting women-only rides and events. It’s a fun cycling club for women of all abilities and skill levels, from first-time riders to women racing every weekend. While providing opportunities for women to learn, ride and connect with like-minded riders is at the heart of Revolve’s mission, the club recognises the importance of contributing to the building and maintaining of trails in the Wellington area. Over the years this contribution has traditionally been made by donating a set amount per rider to the trails where events are held. However, when Hyperformance Hardware, Juliana Bicycles’ NZ distributor, provided Revolve with an opportunity that could take their funding to the next level, Revolve stepped up its game. Hyperformance Hardware representative Sandra Williams says partnering with Revolve on this project was a no brainer for the company that promotes and sells the Juliana brand. “Juliana Bicycles was created to support women in mountain biking by giving them a brand to call their own – not because they needed it but because they wanted it. Since the beginning, we’ve been crafting bikes that are every bit as capable as Juliana’s Santa Cruz counterpart to suit the adventurous women who ride them. The raffle was a success, raising more than $2400, and Revolve was thrilled to see one of its own long-time members, Marilyn Northcotte, walk away with the Juliana Joplin in hand. The proceeds were combined with another $700, previously earmarked for trail building, bringing the total to $3,100. After a considered evaluation process, the Revolve committee and its members have agreed to donate the proceeds to the Brooklyn Trail Builders for the new descending trail in Polhill Reserve. It was a long road to get started on the new descending trail, which was approved in late 2017 after extensive consultation, and the donation echoes Revolve’s consistent support for the project. Brooklyn Trail Builders spokesperson, Rob Lee, says the Revolve donation is extremely generous. “As volunteers, Revolve’s donation gives us a very healthy ability to cover costs associated with our efforts. “BTBs mantra is ‘trails, trees and traps’ – we build trails, plant trees and help trap the pests and predators that pose a risk to the flourishing birdlife in Polhill Reserve. Given we’re just minutes from Wellington’s CBD, we’re continually motivated by the opportunity to encourage people to enjoy the wonderful green spaces Wellington has to offer and improve their experience while they do so. Revolve is super lucky to have amazing trails to ride... So give a little back! Currently, the mountain bike community puts in a huge number of volunteer hours so that we can all enjoy the fabulous and diverse trails our city has to offer. If you bike, run or walk in Wellington, there are heaps of opportunities to help out. No experience needed, just a good attitude (and most work parties have snacks)! Check out the websites and Facebook pages below for scheduled work parties and get digging! For a national overview, check out Trail Fund NZ, a not-for-profit organisation supporting the development and maintenance of publicly available, environmentally sensitive and sustainable mountain bike-accessible trails in New Zealand.